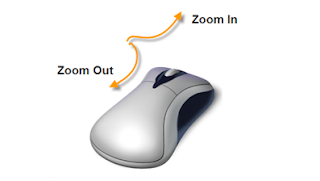 While on the Windows Vista, Window 7 or Windows 8 hold down the Ctrl Key and scroll up and down using the wheel on your mouse. While scrolling up all the icons on the desktop will increase in size and while scrolling down all the icons will decrease in size. Note: that this acts as a zooming function in a web browser or office document as well. Thank you :) keep coming back i will keep this blog fresh with new content.